Mayor Halsema of Amsterdam today received through neighbourhood director Ferry den Edel and the visibly concerned civil servant Ivar Schreurs the observation that most of the houses, properties and workshops belonging to our community ADM yesterday were destroyed ‘by third parties’. The ‘eviction under administrative coercion’ carried out by the municipality of Amsterdam is not only in violation of international law, the UN interim measure to which the Netherlands is bound (including Vienna Treaty Article 26), but was also an indefensible execution of an eviction under administrative coercion as referred to in our national law. For after the municipality had carried out the eviction halfway, by removing us from our site but not the goods of our Community, the site including our goods was transferred to a third party, the cadastral owner of the site, Chidda Vastgoed, with which the municipality did not complete the eviction under administrative pressure. Chidda Vastgoed had a clear plan for this because immediately many bulldozers, cranes and excavators of tenant Koole Maritiem drove into the area and within a few hours they turned our hamlet into a true battlefield. They ruined or destroyed many homes and goods. Yesterday afternoon this was stopped by the municipality. But let us be. The responsibility for our property lay with the municipality. 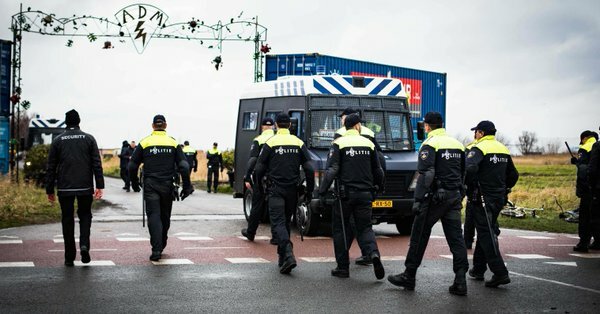 We are of the opinion that such violence against a Community, made possible by the state, would be immediately condemned outside the Netherlands if it did not include a binding UN interim measure. But it is now clear to us that our community ADM on the one hand is recognized by the UN as a community but that in the Netherlands it is invariably called ‘the squatters’ by both the press and the municipality because our community was born 21 years ago. But how the community was created does not matter. Only after yesterday morning’s trial did the municipality start to realise that it may have been stupid and that this damage will actually be recovered from them. The eviction and destruction are both unlawful and we have therefore filed the additional requirement that the municipality should not only allow us to return to the ADM, based on the UN interim measure, but should also ensure that the damage is undone, or that there is comparable replacement housing. While our residents today, under the threatening eyes of the ‘construction workers’ present on the site, are still trying to save some goods and pets, the world wonders how it is possible that the municipality of Amsterdam and the Dutch government completely ignore the 2 requested measures of the United Nations. Both at the start of the eviction and today, our lawyer Mr. Tamas filed a ‘request for a measure of order’ to stop the eviction but both were refused by (the same) judge because ‘the residents would not be in danger of death’. In doing so, the judge ignored the UN interim measure. Eventually the wreckage chamber had to meet and in the course of the week it becomes clear which judge will judge the question whether the Dutch state has to abide by the treaties it signed itself. That is, at the moment, the only question before us. Eventually the wraking chamber had to meet and in the course of the week it becomes clear which judge will judge the question whether the Dutch state has to abide by the treaties it signed itself. That is, at the moment, the only question before us. We, 130 residents, adults and children with their pets and the things we were able to save, are now roaming homeless through the city. We are a close community and, despite everything, look forward to returning to our beloved ADM.